On April 15th, 2013, Boston experienced one of the largest bombing attacks ever to occur on American soil. Three died and over 250 more were injured when two bombs exploded only around a couple of hundred meters apart from the other, sending a ripple effect of chaos into the crowd of 500,000 people. The two bombs were made of pressure cookers filled with pellets and nails., and were placed in backpacks - a delivery method that has become all too common in the United States. New York City also fell victim to bombing attacks using common household items. This incident however, was the first of its kind in Boston. The response that followed was one of trained multiagency collaboration and although the loss of life is always significant, the threat was mitigated in a manner that allowed for the minimal number of casualties to be incurred following such a non-conventional attack. Why was the Marathon Bombing different? Boston has experienced incidents with improvised explosive devices (IEDs) in the past. In 1985, Bomb Technician Randy Lamattina was working to deactivate a pipe bomb when it detonated and, although he recovered, left Mr. Lamattina seriously injured. Then, in 1991, Boston Police Bomb Technician Jerry Hurley was killed, and his colleague Frank Foley was left with one eye after an IED exploded from under a vehicle as they also attempted to deactivate the device. What made the Boston Marathon Bombing different however was the size of the affected area and population. Both incidents mentioned above were isolated, affecting the technicians working hard to mitigate the threats, while the Marathon Bombing was an attack during a high visibility event (HVE) with an attendance of half a million people. The ability to minimize casualties, respond to the incident, and mitigate the threat is challenged in the case of the latter. Despite the critical impact of the bombing, the city of Boston had prepared and planned for the possibility of an attack. Two teams were put in place prior to the start of the race. The teams consisted of four bomb technicians, four detection trained K-9s and one supervisor to oversee the efforts. Having two teams placed within a few hundred meters of the site where the attack occurred allowed for the teams to respond incredibly efficiently, considering the circumstances. The traditional procedure is to attend to the victims of an attack, isolate the area, scan and search the area for additional threats, and secure the scene, so that evidence can be properly collected with minimal interference. Due to the large scale attendance to the marathon and the large area that this affected however, the ability to follow these procedures was extremely difficult for Boston’s first responders. This made them unable to secure the area in order to make way for automated robots and other devices to mitigate the threat. Having to do much of the work manually not only delayed the procedures but increased the risk for more casualties. 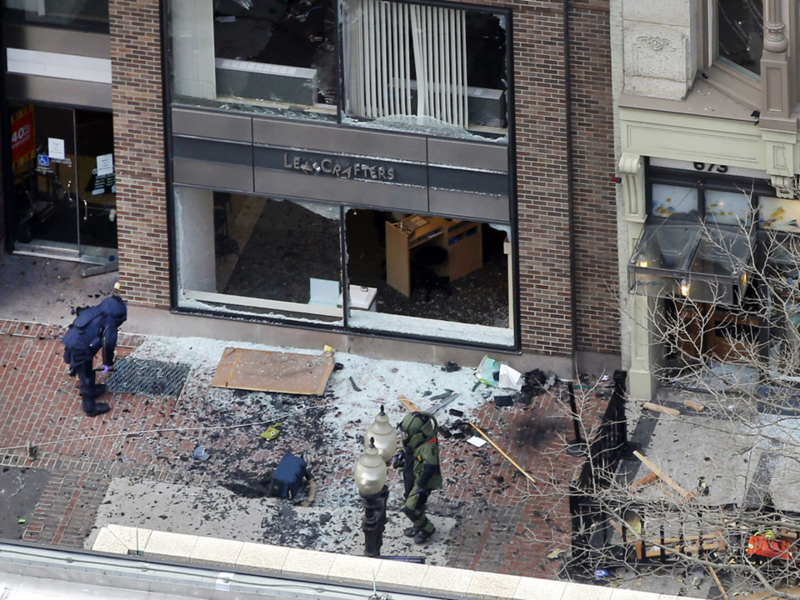 In the days that proceeded the attack, the US Army National Guard 387th Explosive Ordnance Disposal (EOD) Company, the Connecticut and New Hampshire State Police Departments, Certified Explosive Specialists (CES), and Special Agent Bomb Technicians from the Federal Bureau of Investigation (FBI) all took part in the concerted effort to secure the Boston area and bring those responsible into custody. The multiagency collaboration needed for responding to such an attack could have only been dawned with through the process of streamlining the training process. This is precisely what has been done with the Bomb Squads located in the United States. All Bomb Squads are trained at the FBI Hazardous Device School in Huntsville, Alabama. This allows for coordination to be smooth and efficient as all teams are trained on the same procedures and with the same equipment. A lesson learned over many years of experience, but one that has done the city of Boston a service in the case of the Boston Marathon Bombing. 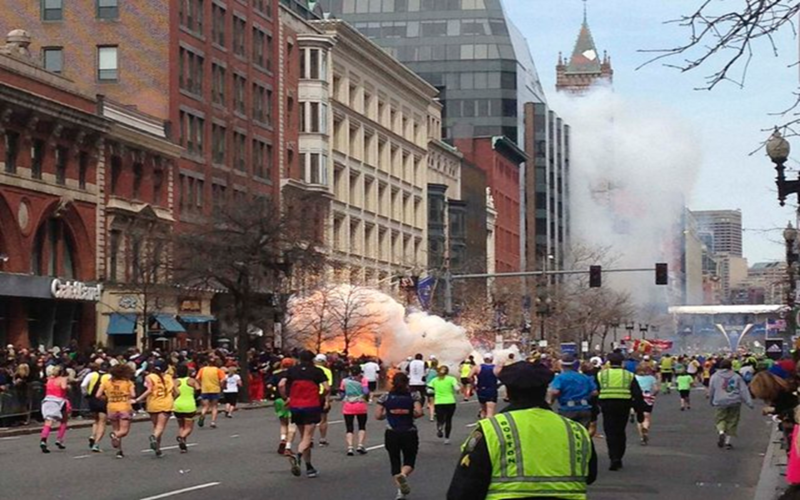 Since the Boston Marathon Bombing in 2013, many lessons have been considered by emergency management officials and first responders responsible for NCTs such as the use of IEDs. For example, now at HVEs, additional manpower is allotted to secure the area hosting the event. What used to warrant four or five response vehicles now allows for closer to 20. This is due to the fact that response teams, such as the Boston Police Department, have made a concerted effort to acquire more mobile and personal equipment. In this way, instead of having a large vehicle attempt to enter a scene of an incident, an individual responder can take their personal mobile equipment in their cruiser and get right to the location of the incident. Emergency management officials have also ensured that there are secured areas set-up to scan and detect threats at HVEs. This is an important step in order to incredibly diminish the risk of an attack. Lastly, officials in charge of emergency management have recognized that IED incidents at such HVEs require truly regional responses. This has pushed to have certifications and trainings even more streamlined in an effort to improve the efficiency of the response. Taking these lessons into account, the Boston Metropolitan Area, as well as the whole of the United States, is now better prepared and secure from NCTs. The information for this article was obtained with the help from Sgt. Chris Connolly, Supervisor of the Explosive Ordnance Unit of the Boston Police Department. Sgt. Connolly was also the Supervisor in charge of all Boston Police Explosive Ordnance Personnel during the 2013 Boston Marathon and assisted with coordinating the response of outside agency EOD Units to calls for service immediately following the bombings.